Corona and Crisps This special Father&apos;s Day hamper is the perfect gift to show him just how much you appreciate everything he has done for you. From healing scraped knees to teaching you the most valuable life lessons, Dad was always there to keep you on the straight and narrow. Available for UK next day delivery, encourage Dad to take a load off with this gift! 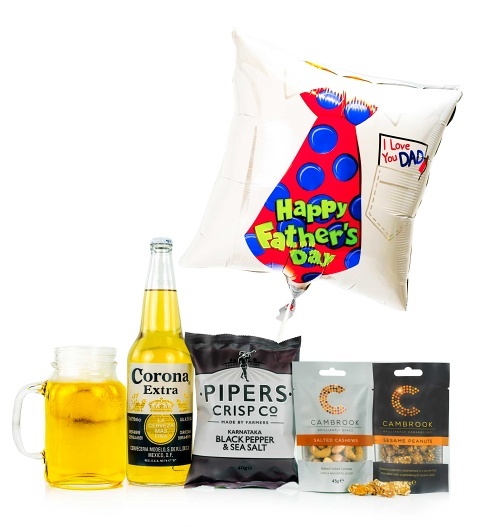 Contains: 1 x Corona Extra 710ml 1 x Pipers Crisp Co Black Pepper & Sea Salt flavour 1 x Cambrook Salted Cashews 1 x Cambrook Sesame Peanuts 1 x Father&apos;s Day Helium Balloon Glass not included.